The Ministry for Pacific Peoples is honouring talented and hardworking Pacific STEM (Science, Technology, Engineering and Maths) students with the Toloa Tertiary Scholarship Awards’ celebration today. The Hon Alfred Ngaro, Minister for Pacific Peoples will be presenting the awards at the Fale o Samoa in Mangere. Pacific peoples are underrepresented in the Science, Technology, Engineering and Maths sector. The Ministry for Pacific Peoples initiated the Toloa scholarships to encourage Pacific young people towards this pathway in an increasingly important knowledge based economy. Last year’s inaugural scholarship winners have gone on to have a hundred percent course completion rate in their first year’s study under the programme. The scholarship programme, now in its second year is part of a three pronged approach in getting Pacific students involved in STEM subjects along with the Toloa Kenese Secondary Schools programme and the Toloa Community fund. Lupesina Koro - Lupesina is of Samoan and Tokelauan descent, Head Girl at her school, her parents’ hard work; sacrifice and support have helped shape her to be the young lady she is today. She’s chosen to study a conjoint degree in Engineering and Commerce at the University of Auckland and pursue fields that interest her in hopes of finding a career that she can feel passionately about. Josh Tafili - Josh is of Samoan and NZ European descent. Josh had chosen to study engineering due to his passion for mathematics and science. He hopes to one day work in mechatronics utilising a mix of mechanical and electrical engineering and developing robot technology. His father Daniel Tafili has been a huge influence on Josh’s life. A self-taught computer programmer, his perseverance and commitment has enabled Josh to adopt this very work ethic. Christian ‘Uhila - Christian is of Tongan descent, born and raised in Auckland. He always gives a hundred percent effort in everything he does and has chosen to devote his talent to study in food science. He cites fellow Tongan and food scientist, Palatasa Havea as being an inspiration, whose journey into food science really resonated with Christian. Among the reasons Christian wants to be a food scientist is so he can make his contribution in reducing Pacific obesity rates. Hawaiki Wallace - Hawaiki is Samoan and Maori, his school Tawa College recognized his ability to lead in appointing him as a prefect, and a student rep at the school’s Board of Trustees. Passionate about the environment, he participates annually in the Titahi Bay Community Clean Up Day. He’s enrolled in the Bachelor of Engineering at University of Auckland in hopes of becoming a civil engineer. Lana Cleverley - Lana is of Samoan and NZ European descent and is studying her first year of Bachelor of Engineering Majoring in Electronic and Computer Systems at Victoria University. She credits her success so far to her family who have shown her that to help and care for others, her education at Wellington East Girls High and sees role models in filmmaker and entrepreneur Casey Neistat and Kevin Rowley from Outward Bound. Joshua Mafi - Joshua is of Tongan born and moved to New Zealand from aged 9, and is going on to study engineering. His parents still live in Tonga and his Uncle and Aunty have been a massive influence in igniting his passion for science and mathematics. He says that this scholarship will be a massive opportunity to him in in pursuing his passion. 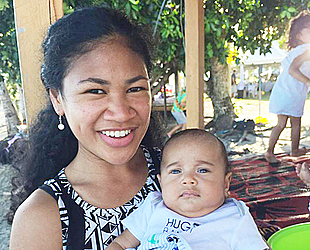 He hopes to pursue a career in the electricity sector and harnessing better resourced the renewable power of tidal and solar in the South Pacific once he completes his studies. Sisilia Teu - Sisilia is of Tongan and Samoan descent, the fourth of five children she believes that giving it your all will help you achieve your goals. Her parents have been the biggest influence in her life in helping mould her into the person she is today and helping her reach her full potential. She’s an admirer of dancer Parris Goebel because of her courage to be different. Sisilia is passionate about ICT and wants to pursue this pathway once she completes her studies. Antony Vavia - Ant is of Cook Islands and Fijian descent, was a 2015 Prime Minister’s Pacific Youth Award winner and is passionate about marine biology. He would love to one day be paid to do what he loves – looking after our oceans. AUT University deemed him an ambassador for the school, and he dedicates his time promoting science to South Auckland primary schools. His family has been a huge force in influencing him to be what he is today. He’s still on his journey, but he’s already shaping up to be a worthwhile role model for young Pacific people to look up to. Jerome Is of Samoan descent and is currently studying Electrical Engineering at the University of Auckland. He was a nominee from 2016, and after narrowly missing the opportunity last year, he was fortunately able to pick up the scholarship in 2017. A keen rugby player and a senior prefect in 2015 at his high school, Sacred Heart College, he’s an incredible role model for young Pacific peoples.